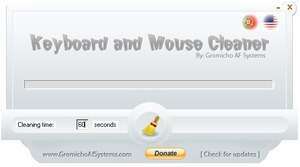 Keyboard and Mouse Cleaner is a simple application which blocks your keyboard and mouse for a while. You just need to choose the cleaning time (example: 60 seconds) and press the big broom icon. And for that 60 seconds (or the time you chose) your keyboard and mouse will stay blocked. For security reasons, you should also check out the Keyboard and Mouse Cleaner download at LO4D.com which includes virus and malware tests. Additional screenshots of this application download may be available, too.